Although it took more time to think about what to do then to actually do it. I went much simpler this year. I decided that I wanted to put a little more focus on the reason we celebrate Christmas. Here she is all Christmafied. Hum, after posting this picture...I noticed I really need to wash my mirror. Since I am so short I can't actually look into the mirror, so from way down here. It looks clean. Anyways, back to the mantel. I have found a new love this season...GLITTER GLASS! I just love my glitter letters! I didn't put our stockings on the mantel this year because I thought it took away from the words. Once I am done with my tree, I will show you that too. I made glitter glass letters with the names of God that mean the most to me. They are so special. So now for my new venture. When I told some of my friends here that I was planning on making the names of God in glitter letters they told me I should sell them... So I am going to see how it goes. So people I will try to get the names of God glitter letter up tomorrow so you can see how they look. But I will be selling the big letters (the ones on the mantel) for $2 a letter and the smaller letters (you will see tomorrow) for $1 a letter. You will have your choice between red and silver glitter. Shipping will depend on where you are. Just email me your order at impatientlypraying (at) gmail (dot) com with the title of the email being order and I can get to it promptly. Since I will be going out of town this weekend I won't be able to ship any out til after Thanksgiving. But that is still plenty of time to decorate your house! Remember I am the rare weird one that is already decorated. I am posting to these parties. How very lovely, and appropriate! so beautiful... thank you for sharing. OOoh I love the mantel, Katie! Can't wait to see your new glass glitter letters. I just added a bunch of new petal pins to my etsy shop today and I'm hoping they do well. I hope your letters do well too! Lots of love to you, friend. I'm so jealous you are already done decorating! What a beautiful mantel! It's so simple and yet just perfect. :) I love your red trees and the letters are awesome! So classic and fancy looking! The letters are sooo super snazzy! I like how you hung just the letter. Just wanted to let you know that I featured this over at Visit <a href="http://craftsandsutch.blogspot.com/2010/11/sutch-inspiration_24.html>Crafts & Sutch</a> today! Please stop by to take a peek and grab a SUTCH an Inspiration button! :) Thanks so much for sharing! Your mantel looks wonderful! I love the bright red. Your banner is perfect! Love the scripture banner...what a great idea! Thanks for sharing! Your mantel is just beautiful and I love the word garland. Such a nice way to put the emphasis back on Christ for Christmas. Love it! Very pretty and thanks for the reminder of what CHRISTmas is about. I love it! I love how you are focusing the REAL meaning of CHRISTMAS! This is fabulous. I would love for you to link this up on my Talent Tuesday Party tomorrow! Really pretty mantel. Love the red lettering with all the greenery! Oooh la lettering! Love those glittering letters! I made a PB knockoff Christmas wreath..come check it out. Simple yet very elegant and well done! This is such a gorgeous mantel! I love the idea of making all of the names of God, too. Fabulous. Glad to see that you are celebrating the real meaning. I love your mantel, it is just beautiful. very pretty! i am pretty anti making it all about Jesus and not because I am not a christian but because i think it really has nothing to do with him and people go overboard on keeping it called christmas when we should rejoice about him everyday just like it were christmas BUT this is so beautiful and really a nice little statement! Lovely! Love the glitter letters! It looks so great, I love the wording you have up. Good luck selling your letters! Love the passage on the garland. So stunning! I'll be featuring this on Friday for my mantel linking party! Just Beautiful! Love the glitter letters! Just what this season is really ALL about! 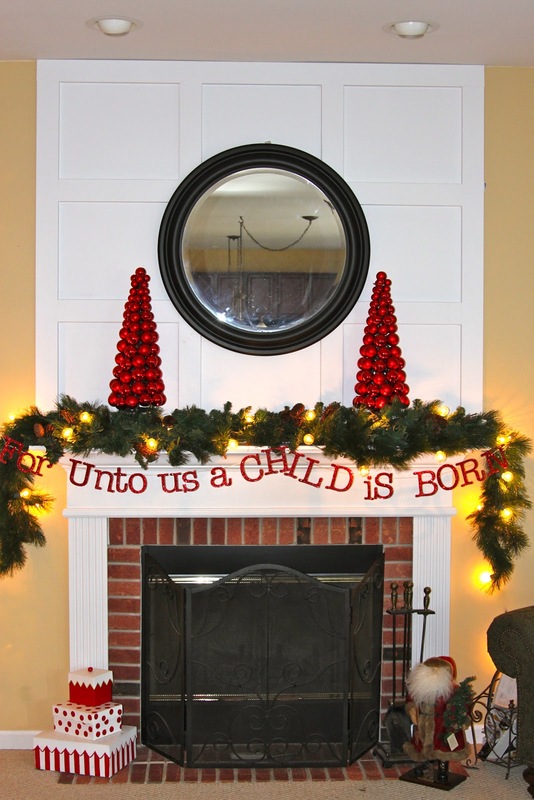 Your mantel looks festive and contains a beautiful message-great job! My Show n Tell is a Holiday post. Something my Husband made and I painted; Last Year! Here is the Link for you. Do stop by if you get a chance. Beautiful! And the phrase is striking. (I agree, stockings would distract from the words) great job! Saw your link on "Show and Tell Saturday" I love simple and this is beautiful! I love your letter garland. So pretty. You certainly are getting the message across and still it's very cheerful! Love it. Oh I just love this. I love the red and I see a splash of it on your tree as well. Beautiful. Wow, I love that mantle! I love your banner. Just perfect! Wowie! I love, love LOVE your glitter words on your mantel!! Beautiful! I just became your newest follower! :) Glad I found your blog, very nice! This is so beautiful. I hope you don't mind me featuring it on Sunday. where did you get the cute boxes on the LH side of your fireplace? A winner and an Acheivement! Silhouette's make your own tattoos!